Can she forgive and forget-and fall in love? 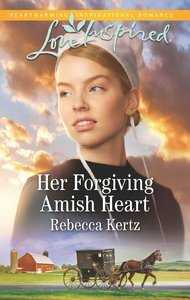 About "Her Forgiving Amish Heart (Women of Lancaster County) (Love Inspired Series)"
Rebecca Kertz moved to rural Delaware as a young newlywed. First introduced to the Amish world when her husband took a job with an Amish construction crew, she enjoyed watching the children at play and in swapping recipes with the Amish foreman's wife. Rebecca resides happily with her husband and dog. She feels blessed to have family nearby. She enjoys visiting Lancaster County, the setting for her Amish stories. When not writing, she enjoys traveling, reading and doing crafts.